How do I change the name of a page in Website Builder? 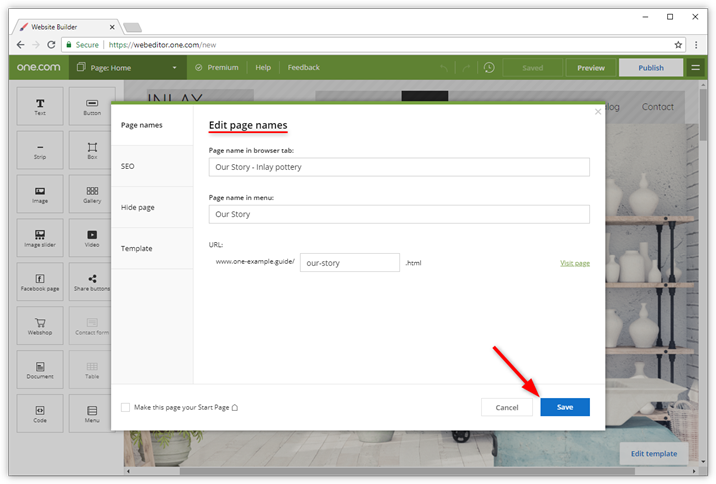 In Website Builder, click the Pages menu in the green bar at the top of the screen. Move your mouse over the page you want to change the name of, and click the information icon (a circle with an i). Page name in browser tab - the name visible in your browser tab at the top of the screen. Page name in menu - what the page is called in the menu on your site. URL - the name of the page in the address in your browser, it will also become the file or folder name of the page on your web space. When you are done changing things, click Save. Click Save and Publish to make your changes visible online. Note: When you change the URL of your page, we recommend using only lowercase, numbers and hyphens. Also remember to update links to this page on your site. Links in the menu will update automatically.